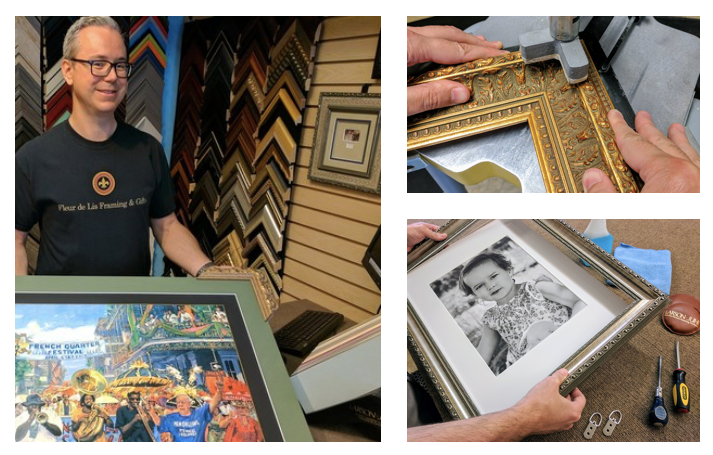 ​Located in the heart of River Ridge, a suburb of the Greater New Orleans area, our full-service custom frame shop features an outstanding collection of high quality custom frame mouldings and mattes. With a background in art history and over 20 years of retail and custom framing experience, our master framer and owner, Kyle Henson, is respected and sought after by countless designers and art connoisseurs for his exceptional individualized service, expansive knowledge, and creative flair. Customers often tell us that we have an eye for sophisticated design and we would like work with you on your project helping to guiding your eye for design every step of the way. What would your walls say if they could talk! Experts in conservation framing, we use UV protective glass, high quality mouldings, and one hundred percent acid-free mattes. We offer an outstanding selection to choose from to best complement your cherished artwork and preserve your investment. Coupled with everyday low prices and a satisfaction guarantee you will be assured that you will be happy with your purchase. Or we'll make it right! Our vast selection of frame mouldings and individualized attention allows us to customize each order with careful consideration to providing our customers with the finest in value, service and workmanship. Our experienced designers will work with you to bring about a frame design for your art that will suit your needs and bring you years of pleasure. If you are unable to visit us during our normal business hours, our professional staff is available seven days a week (by appointment) for an individual custom framing consultation. Please call or come in today!